PLEASE tell me it comes furnished! The place looks largely untouched since 1952, including the too too fabulous wallpapers! I really like this house and hope the curved desk conveys! I’d take it if they let the desk stay. This is beautiful. Very unique. I love it as much as the hexagon houses. The two bathrooms are amazing. It’s an OHD side effect. After following the site for a while I’m really beginning to question my aversion to wallpaper. There’s just been so many great wallpapered rooms on here lately. 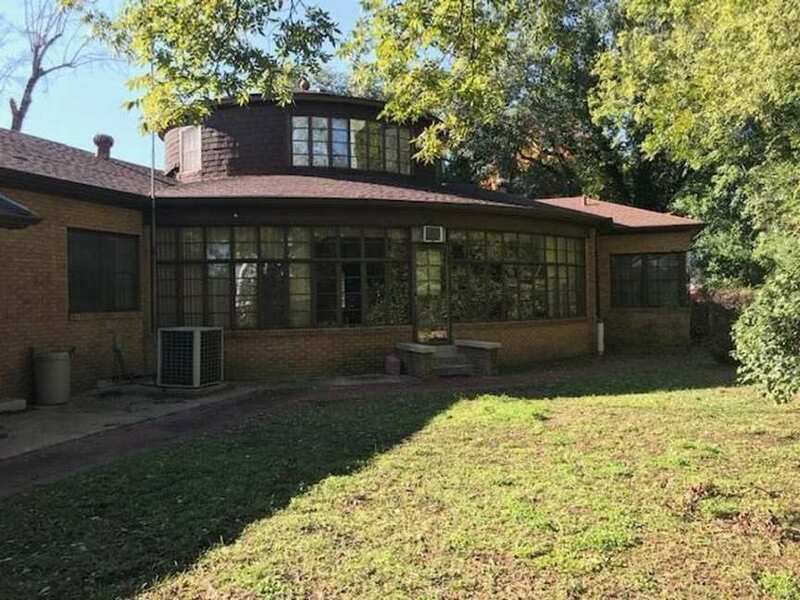 The house was owned for many years by Mr. James C. Gelvin and his wife, the former Wanda June Strawn. She died in 2013 at age 90 and the house is still in her estate. Her parents, Dayton & Octie Strawn, lived on N. Main St. and may have built the house originally. In any event, the progressive 1950’s architecture was later overwhelmed inside by a Colonial-themed makeover which is still intact over 50 years later. It’s an interesting display of Modern vs. Traditional. Thanks for the background information on the past owners! The “Colonial” interior did not occur later, however; the house was actually built this way! The fluted woodwork throughout is undoubtedly original; there is not a shred of evidence to support the makeover you suggest. The house is a true time capsule! After looking at the deeds, it turns out the Gelvins purchased the house in 1978 from an unrelated lady who bought it in 1973. So the furnishings are at least two owners removed from the original. 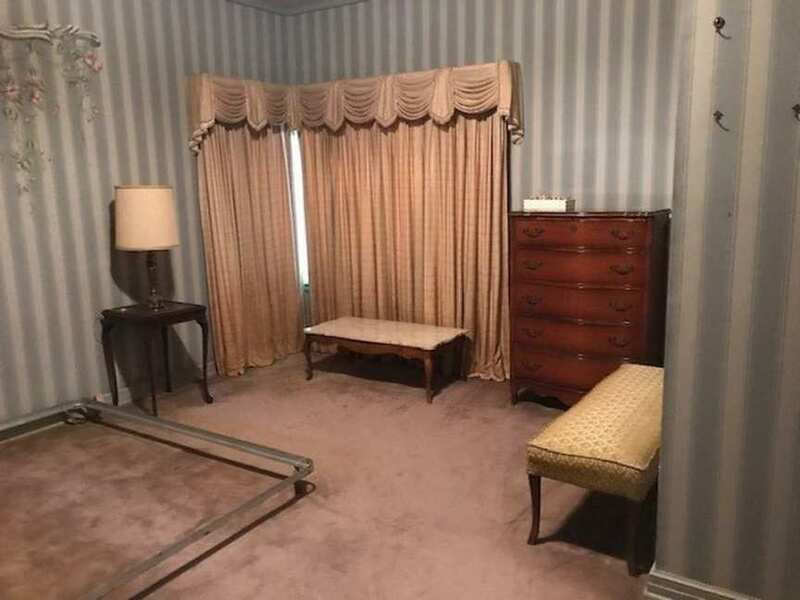 I get that some folks may like the “Granny’s house” look of the place, but the department store decor is hardly Architectural Digest material. I thought that the Colonial mantel, and the dentillated crown moldings in only part of the house suggested a makeover at an early date. I can’t prove that it wasn’t built that way, though the complete disconnect between the exterior architecture and the interior looks like the work of different designers. 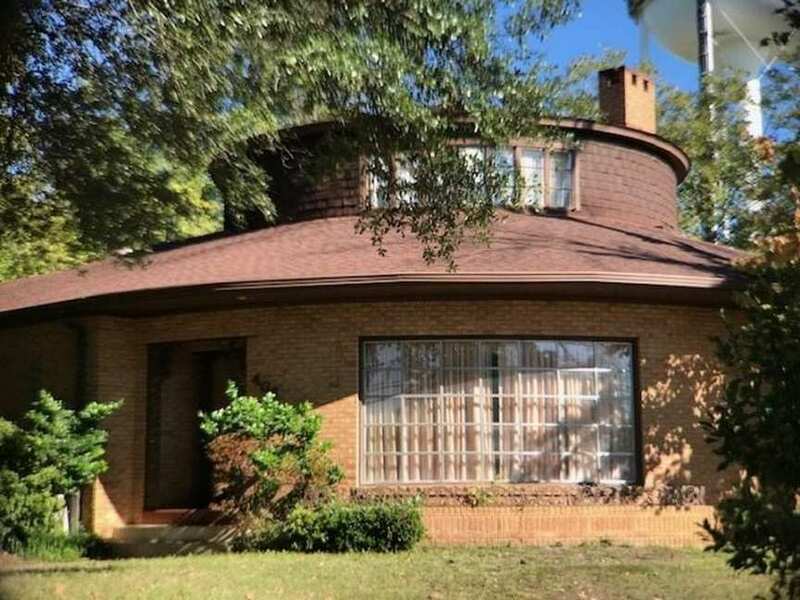 The contrast in style between the round sun porch and the living room could barely be more extreme. 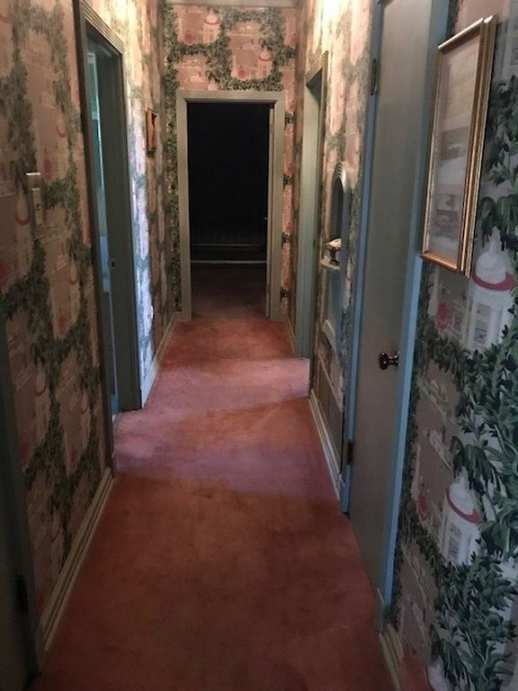 While furnishings may come and go, the house itself has received little alteration aside from some kitchen updates; many of the wallpapers appear to be c. 1950 as does the woodwork. What I find really interesting about the under-scaled fluted door casings is the use of petite plinth blocks. I’ve seen similar ones before in houses from the 50’s but they are rather scarce. 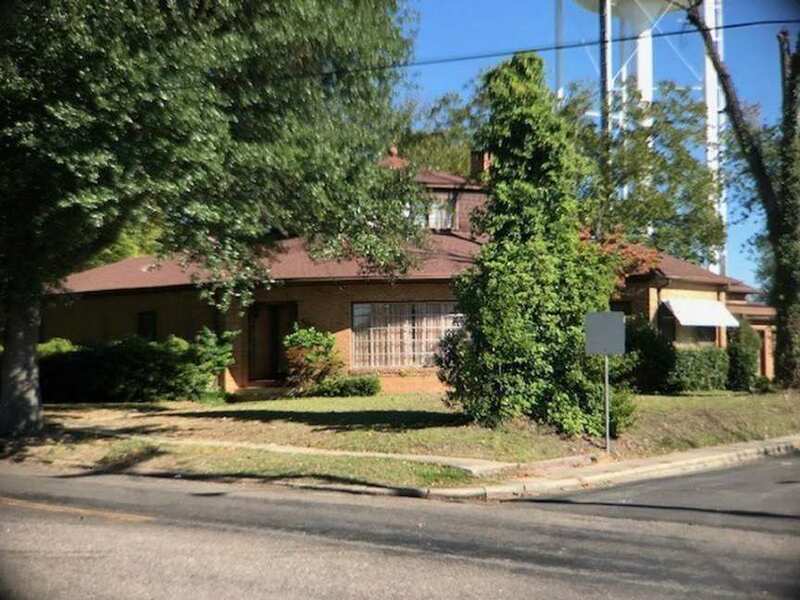 I’m very surprised to learn that the house has changed hands at least twice… that is quite interesting because the house certainly has the look of one that has been lived in continuously for about 50 years. Thanks for researching that! 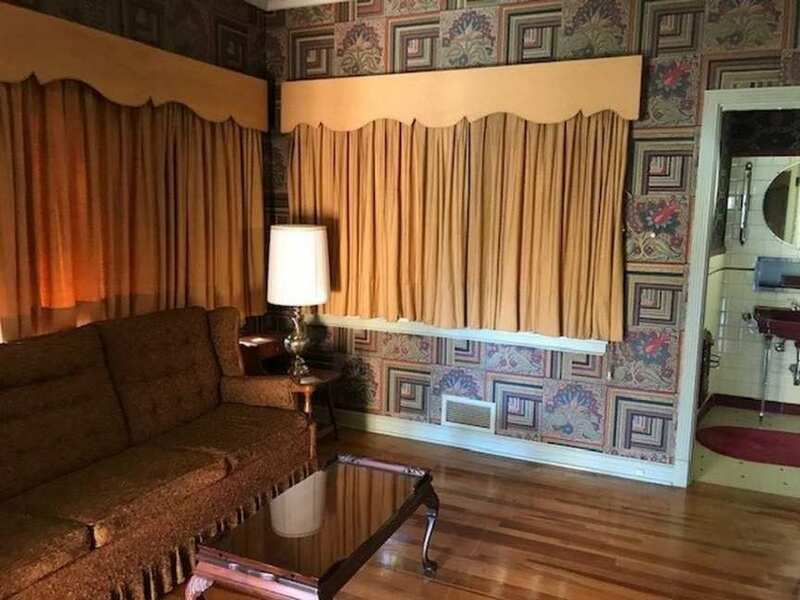 Not many people would want to live with such dated wallpapers – and this house found two different owners who were willing to do so! 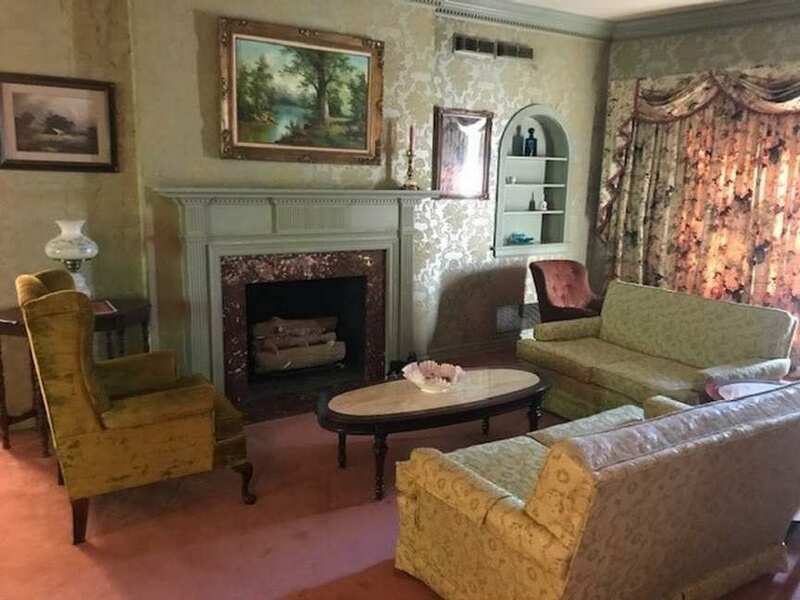 So, given that the furnishings do not appear to be original, you are absolutely correct that the house is not a true time capsule, and it gives me hope that the next owner will keep many of these interesting finishes. I still maintain that the house did not start out with a modern interior which was later Colonialized. Just as the current furnishings are not high style, neither is the exterior. It’s novel, and fun, but was never at the cutting edge of modernism. It appears to be a house designed for people who were basically traditional, but wanted something that wasn’t too stuffy-looking on the outside. Or perhaps it was a compromise; She got a traditional interior in exchange for tolerating his love for modern design on the oustside! Now that I know that it hasn’t been in the same family since new it has lost a little of its mystique for me. But I still really like it! 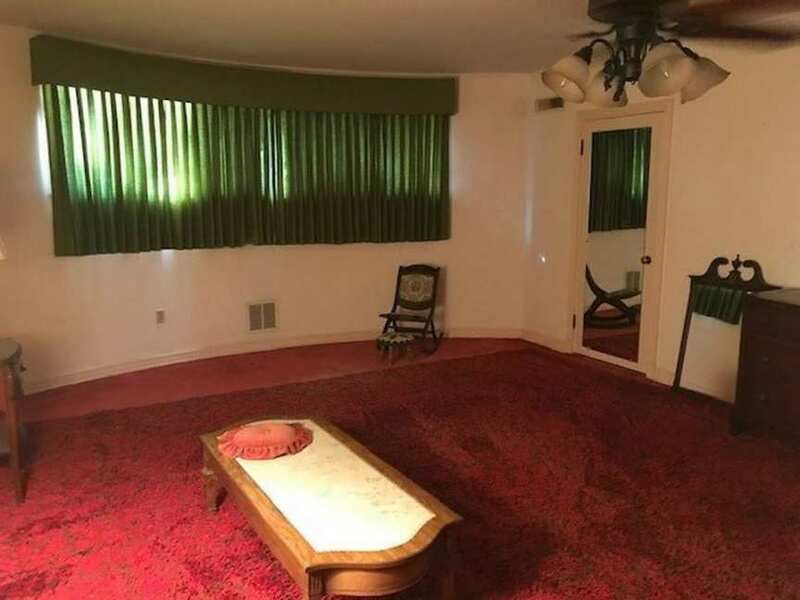 As someone who’s lived in the 50’s and 70’s, the interior looks “updated” in the 70s. Not only the materials but the way folks wanted it to look luxurious – a 1970s luxurious no matter the intended style of the house. If there’s a time capsule here, it’s of that era with bits of the original left. 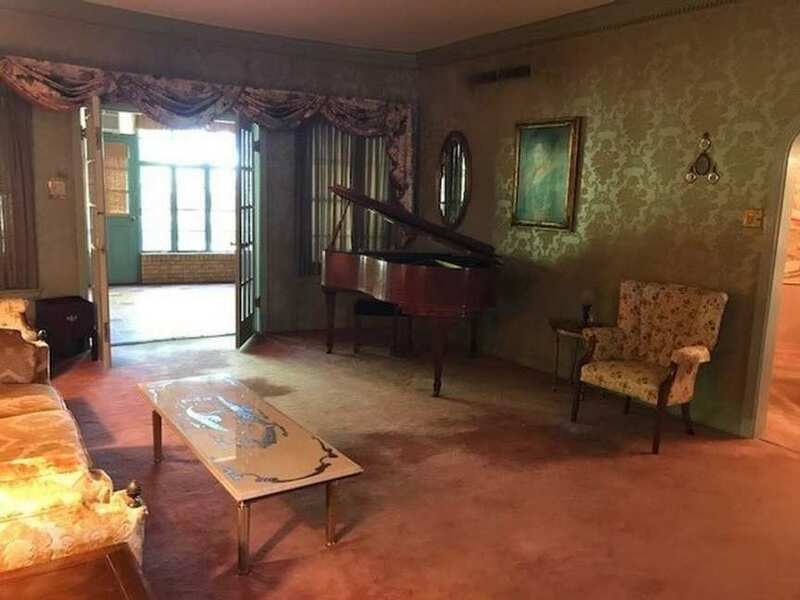 I know it would break the hearts of all the 1970s fans but I think this home would look more appropriate taken to more simple walls, floors and decor. An opinion for sure but one I feel is correct. 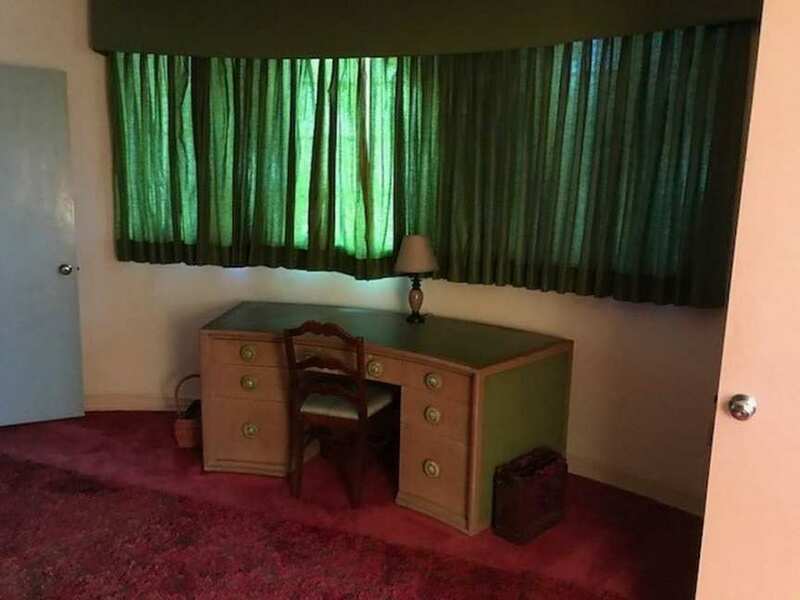 I agree that the wallpaper, carpet, and furnishings look more ’70s than ’50s, though I couldn’t swear to it. 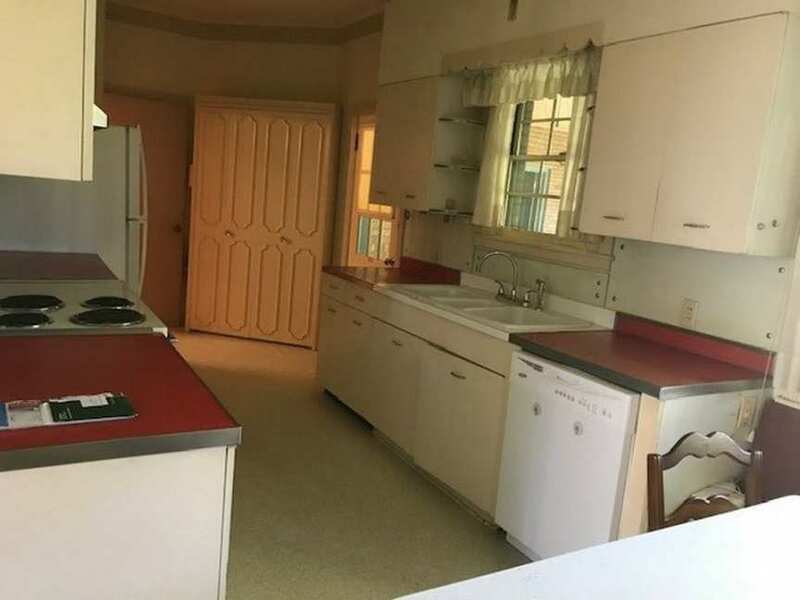 I do think that the bathrooms and the kitchen cabinets and counter are 50s, and I would definitely keep those. Time capsule house. 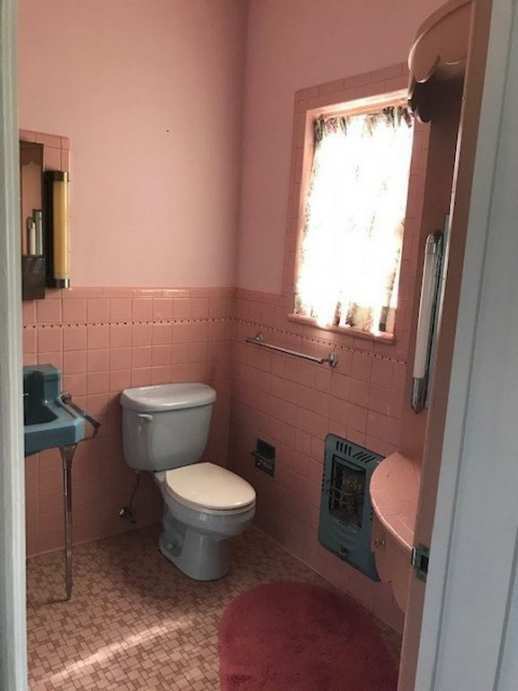 With pink bathrooms!! I love it! 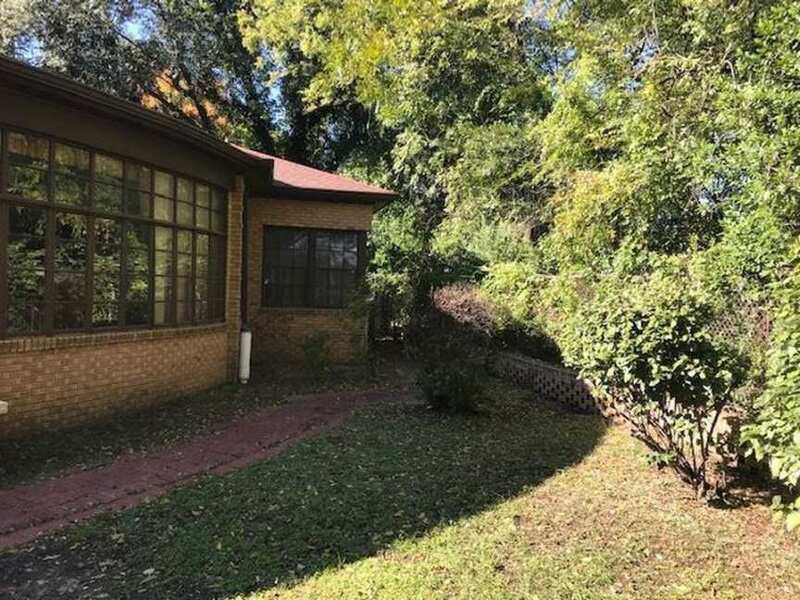 But on Realtor.com it looks like the property taxes are $4000 a year! That’s $333 a month in property taxes! That stopped me from contacting the realtor! Unless you hear it directly from the agents or owners mouth or see tax receipts, do not believe what you read on those sites. For instance, Zillow says less than $900/year….that’s why you need to contact the agent to verify the real amount. This is actually listed under market value. According to the Gregg CAD it’s appraised value is 191,690 and has estimated taxes of 5,276. I live in Ellis county and our taxes are ridiculous so I’m always curious about other counties in Texas. I live about 15 minutes east of Gladewater and I just went the the Gregg county tax site and the current taxes are $893. Now, I’m sure it has been frozen for several years due to the age of the last owner so I’m not sure how much they would be now, but it couldn’t of gone up that much, maybe doubled which would be closer to $1800 maybe $2000 but don’t take my word for it. Maybe I’m not looking in the right spot but when I go to the website it says estimated taxes without exemptions is 5276. I really do not like wallpaper. Seriously. Not my thing. But I would not touch a thing in this house and the wallpaper is so charming! It helps make the house. It does seem to have a bit of split personality going on, but that just adds to the charm. 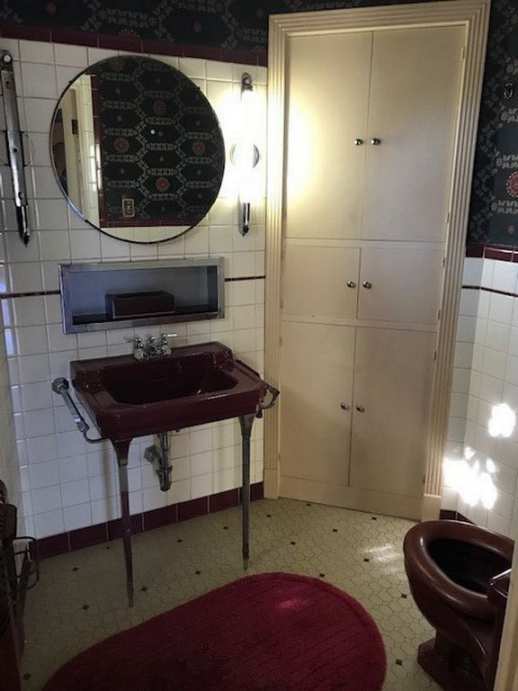 And those lovely tile bathrooms! I love the dualing identities here. Not only is the interior styling all buttoned up but the rooms are surprisingly squarish, with a curve happening here or there for a splash of delight. The square pane windows and typical brickwork carry the personality of the most conservative of mid century houses, but here they are reimagined in surprising geometries. Especially well executed is the very thin edge of the roof overhang, which gives the house a feeling of rotation and flight. It makes the house feel taught and light. Imagine how awkward it would look if this same edge were thick. The wall of glass in the back only adds to this amazing effect where everything has been thinned down to almost nothing. The upper level is not unlike a crows nest on a ship, in that it is too small to be much more than a hideaway perch. But that is what makes this high perch so fantastic to ponder — what’s up there and what is it like? Amazing in every way. 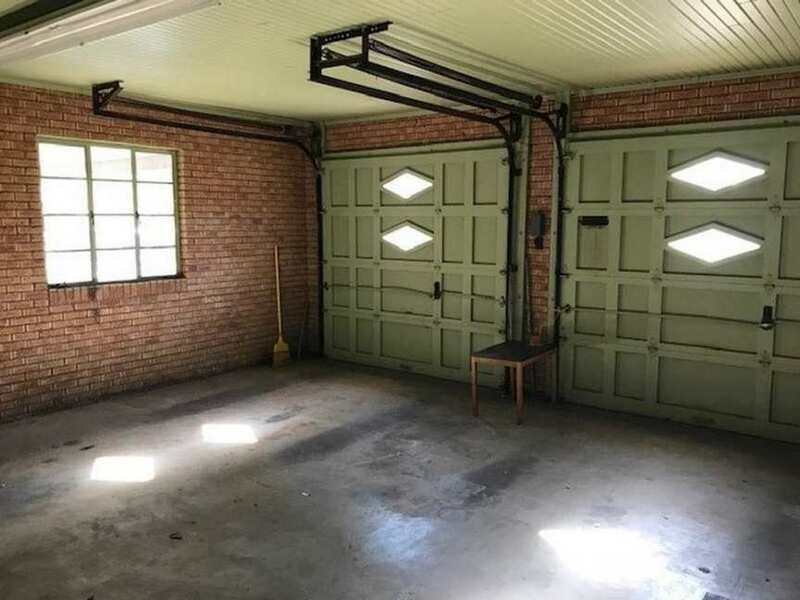 The shower door in picture 19 was interesting. I would love to see a floorplan of this house! I am overwhelmed. I want to see it preserved just as it is. (Well, maybe the carpets could be cleaned.) 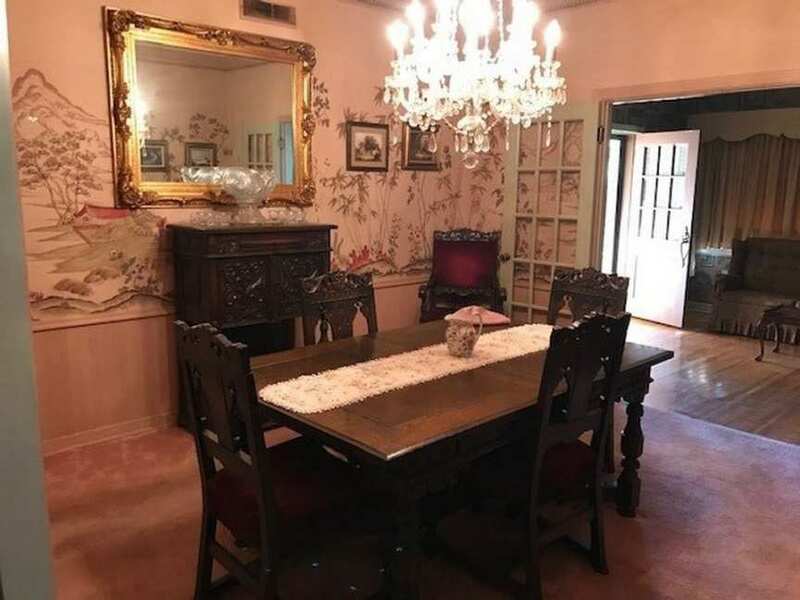 If I were going to live in it, I’d have a hard time with some of the wallpaper (though I really like a lot of it, especially in that first room). But I would try to be prudent about what I’d replace. In addition to the yummy roundness and curves, my favorite things are the bathrooms. I hope no one rips those out! 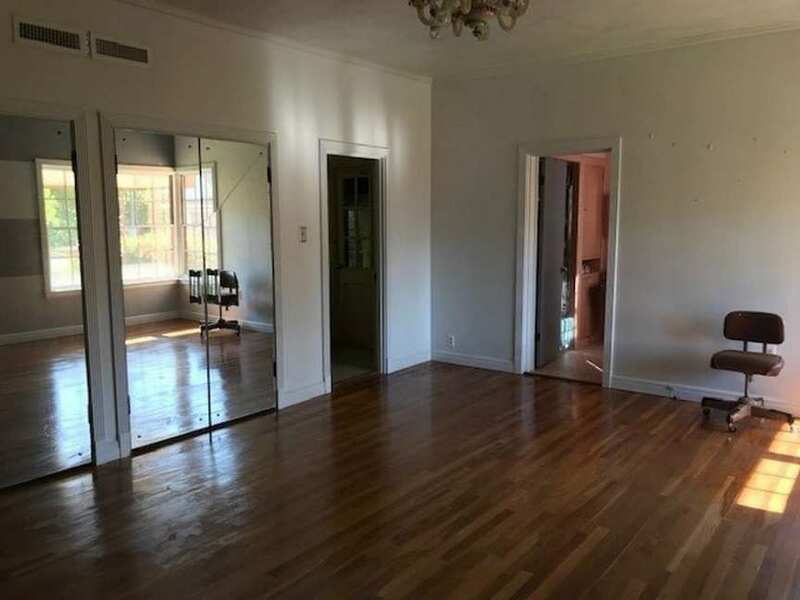 This house appeared 4 years ago on another site I follow. The build date given there was 1940s. 1946, I believe. The price has dropped a good bit. I detoured on the way to Dallas back then to check it out. (drive by, didn’t go in) It is next to a funeral home, which wouldn’t bother me a bit, and across from some blighted property, which also would not concern me. 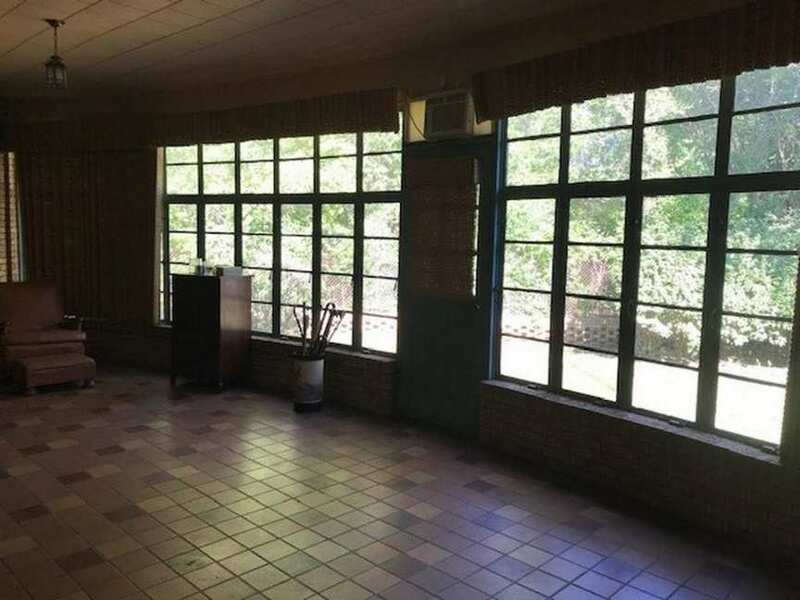 Small town living, and all that… The interior at that time definitely looked more 40s than 50s. It seems to have been toned down some since that listing. Looking on google earth, I dont see the blighted property I thought was across the street, so I must have conflated this property with another I have seen. The funeral home is still there, so that is good news! Very cool. Not only is it a unique shape but it’s a time capsule too! This. Please. I’ve been good…mostly. I want this house. Amazingly unique! So much to look at in wonder. 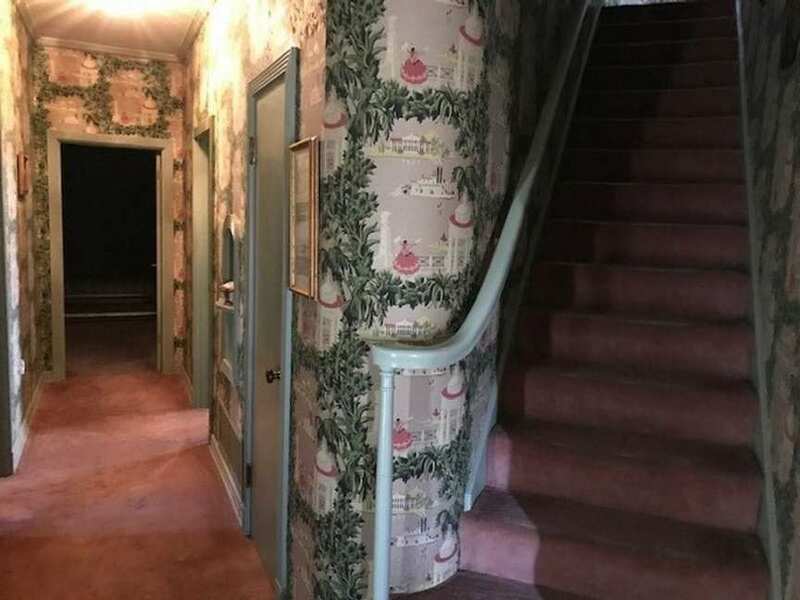 But I really wonder what happened to the guy(s) who installed that stairway & hall wallpaper – certainly, they might have lost their little minds feverishly trying to match that pattern. Are those power lines/electric towers behind the home? I grew up in White Oak (about five minutes down the road) and have always loved this house. 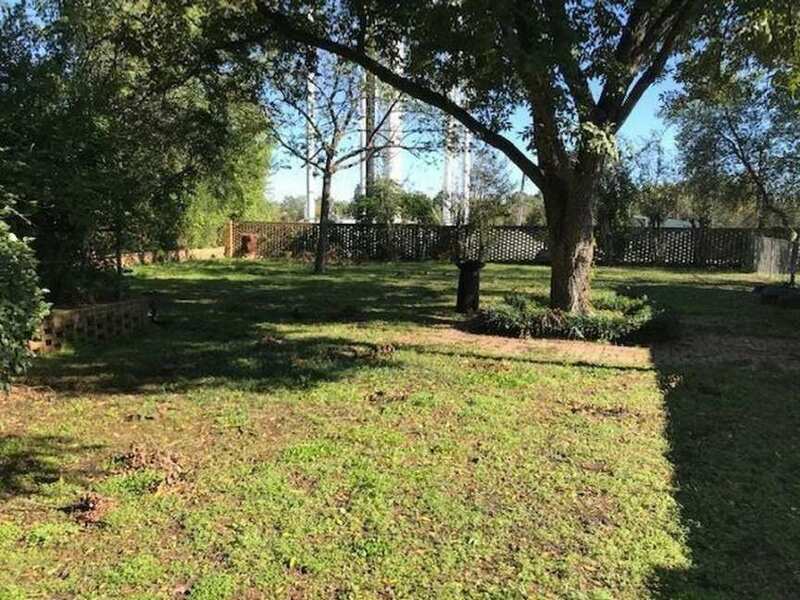 Gladewater is a little bit of a rough town but there are some spectacular homes downtown! Aside from the carpet, I wouldn’t change a thing. And I don’t even like wallpaper, but I love this wallpaper. Don’t even get me started on the curved desk and those lovely couches and matching chairs! Love the clean lines of this style! This has slowly reduced in price since being posted last year. Thought I’d move to the front page for another look. Comments above may be older. That is quite the rainbow of toilets and sinks! Not really my choice of style, other than the bathrooms, but it’s a nice place. Now this is a true time capsule! 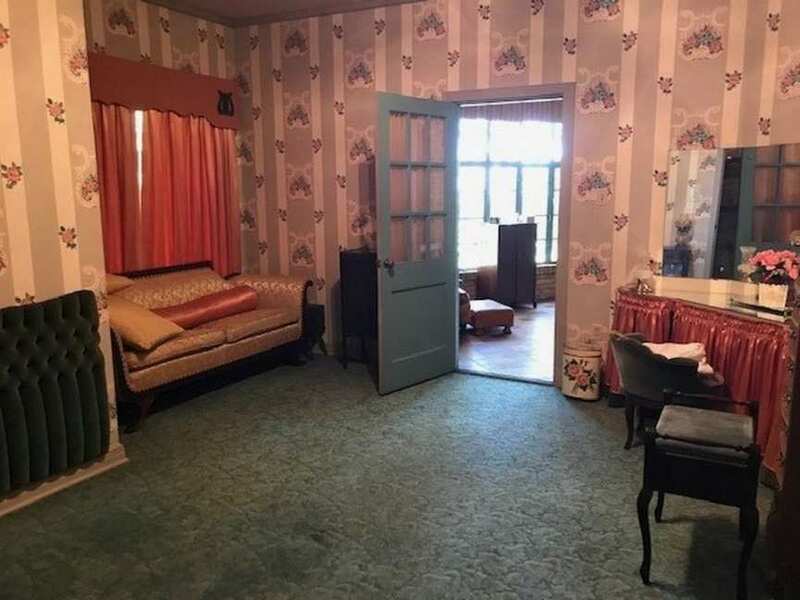 I wouldn’t decorate a house this way on purpose, but if I were fortunate enough to buy this I would live there happily without changing a thing, revelling in the fabulous grandma’s-house-ness of it all! I saw this earlier and just loved it. Don’t like how close it is to the street, but the back is great. The bathrooms are fab, I agree the fireplace, while lovely, doesn’t look like it fits. I wonder if there are wood floors under the carpet? 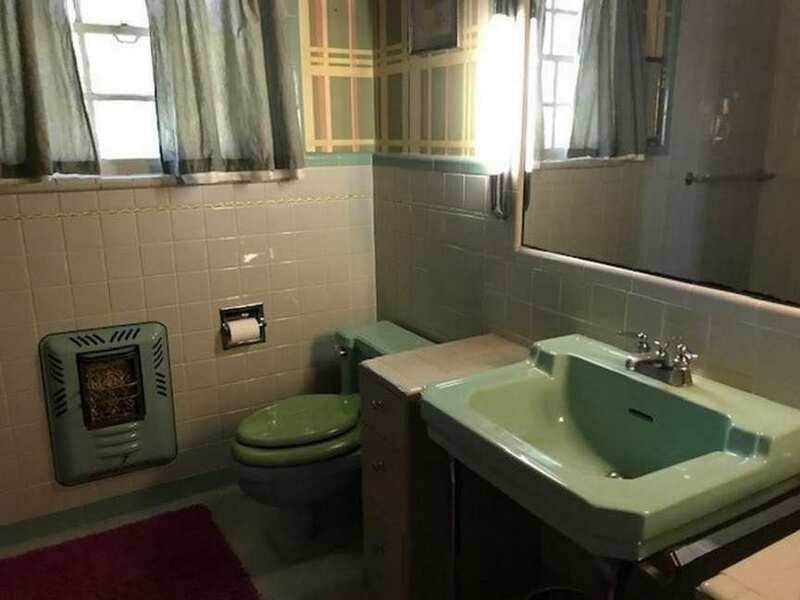 If I got it, I would update the kitchen, fix anything in the baths, but mostly keep them original, Take down most of the wall paper (just not a fan- *so* busy*). 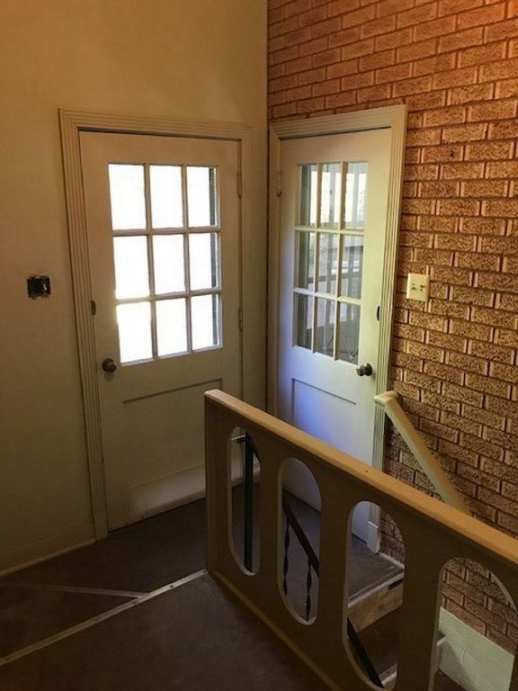 Wondering about the large price drops (checked on Zillow.) Also wonder what the electrical is like; would it have to be brought to code? I’d like to see the interior of that house msjeanne28 is talking about. 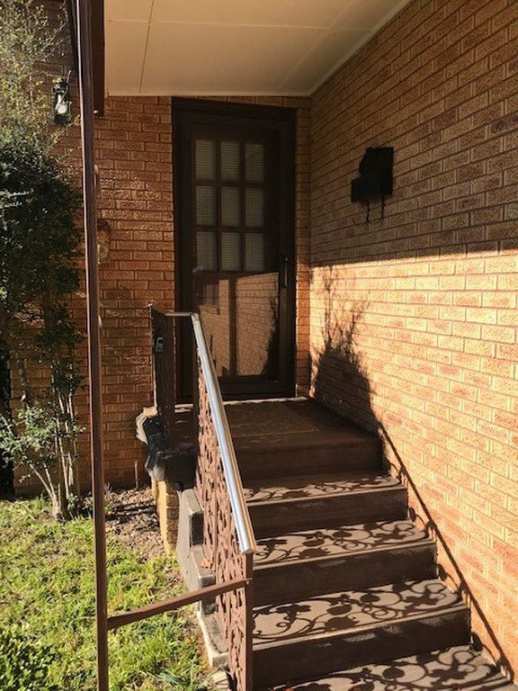 Looks like great curb appeal and a decent price! 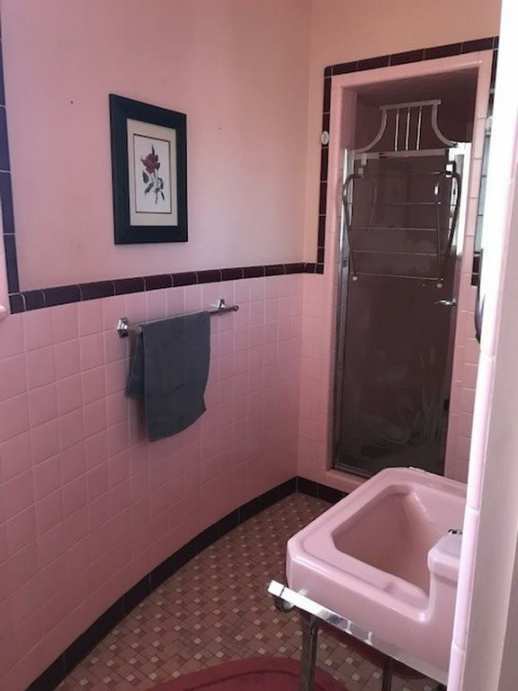 A long, long, long time ago, I remember these types of tiled bathrooms and always thought they were ugly… now I think they are the cutest on the block! So what made me change my mind? Who knows… maybe nostalgia!